This is basically a Bûche de Noël. I refrained from calling it that for two reasons. The first is that my grandmother never referred to it as such and instead called it a chocolate roll. Probably because she was technically Jewish but also because my grandfather was somewhat anti-holiday. The second reason is that most Buche de Noel has meringue mushrooms and/or other decorations that make it look like a log – all tasty but a fair amount of extra work when we all know the cake is the real star of the show. Although three separate components make up this cake, each is fairly quick and the assembly is simple. My grandmother’s multi-purpose Chocolate Pastry (sponge cake) is the base of the cake. Made with melted semi-sweet chocolate and meringue, it melts in your mouth even before the filling and frosting are added. Basic whipped cream flavored with cocoa powder makes up the filling. The roll is perfectly delicious with just the cake and filling but to take it up a notch, I frosted it with another versatile Paula Peck recipe: Mocha Buttercream. I might be addicted to this stuff. It’s so easy to make and the coffee deepens the chocolate flavor, making it bold and rich. 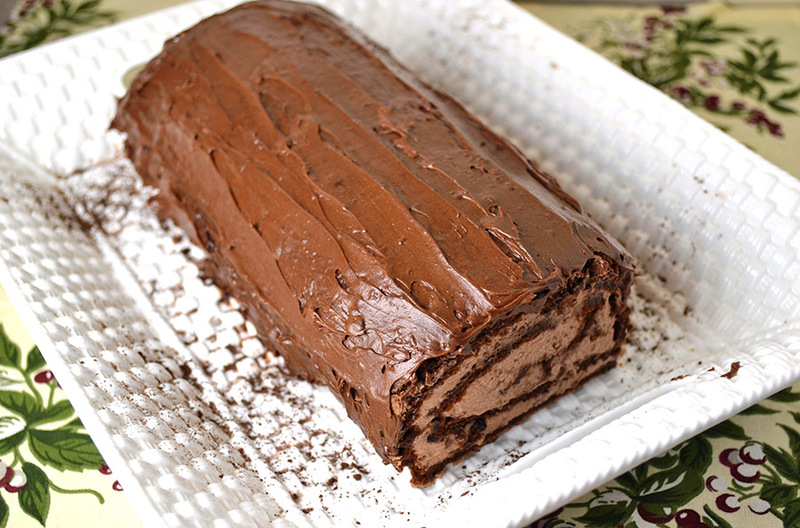 The final chocolate roll is moist and chocolaty, the perfect dessert to end Christmas dinner or even just to satisfy a serious chocolate cake craving. Whip heavy cream in an electric mixer. When cream begins to thicken, gradually add sugar, vanilla, and cocoa powder. Place chocolate pastry on a sheet of wax paper large enough to extend at least 1 inch on all sides and dusted with cocoa powder. Spread pastry with filling. Lifting one long side of the wax paper, roll pastry inward. Continue to lift wax paper while pastry rolls up, jelly-roll style. Roll will crack, but cracks will be covered with frosting. Twist wax paper firmly around chocolate roll to help give it shape. Frost cake with mocha buttercream. Thank you for sharing this recipe–it’s a treasured holiday memory for me, and so it was especially exciting for me to prepare it on my own for the first time this Christmas. My mother used Paula Peck’s egg yolk buttercream flavored with chocolate to ice her Yule log; the buttercream you’ve given us here is indeed most speedy and wonderfully intense. I missed the directions to use 1/2 the recipe of buttercream so my very first Yule log has a LOT of chocolate on it! Thanks Lisa! I’m so glad you enjoyed it. Yes, the full mocha buttercream recipe makes a lot (I actually did the same thing during testing) – but you can never have too much chocolate!